Ron Turner, Pep Hamilton and others on the firing line, too. 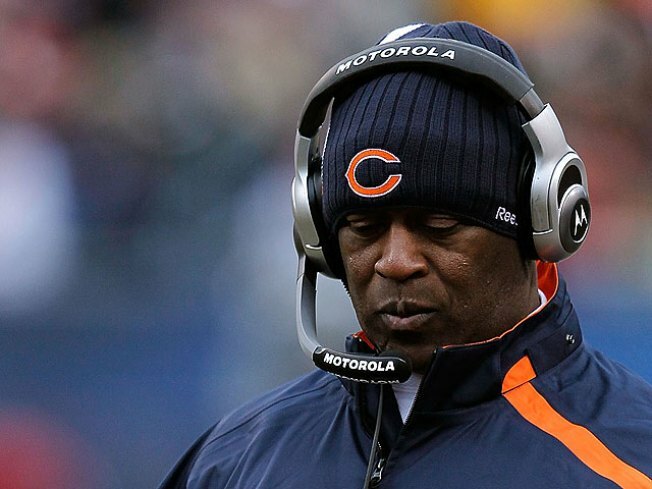 Lovie Smith may have saved his job with another Bears win Sunday in Detroit. A 37-23 win over the Detroit Lions gave the Chicago Bears their second straight wins over NFC North opponents. But did Lovie Smith save his job? "Until someone tells me otherwise, after the game normally I come to work, " Smith said after Sunday's road win. Jay Cutler's four-touchdown performance without an interception along with Matt Forte's second 100-yard effort against the Lions may not be enough to stem systemic change. "I think change is necessary from top to bottom with everybody who had anything to do with where we are right now," Smith said about what needs to happen in the coming days. "I think all of us didn't do as good a job as we needed to. As a head football coach, I didn't do as good a job as I need to and (the list of coaches responsible) goes down." Some Bears players wanted to take the hit for their 7-9 season - instead of their coach. "It's all on the players at the end of the day," Devin Hester said. "Coaches make great calls, we got to make plays." But fans still want someone to take the fall for three straight Januaries on the sidelines after a Super Bowl appearance. And, if Halas Hall walls could talk, we might know the future of the Bears. Smith will meet with management and coaches Monday at Halas Hall, but won't speak publicly until later in the week. Jerry Angelo, who normally watches away games from the press box, was conspicuously missing Sunday. Maybe he had already seen enough.